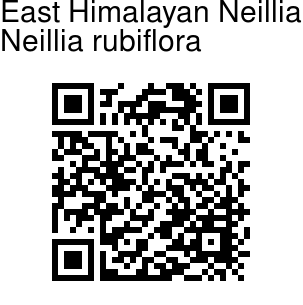 East Himalayan Neillia is a shrub up to 2 m tall. Branchlets are red-purple, angled, hairy when young, becoming hairless, buds purple-red, ovoid, with 2 or 3 scales hairless or slightly velvety at margin, tip pointed. Stipules are ovate-lanceolate or linear-lanceolate, membranous, slightly pubescent, margin entire, tip long-pointed. Leaf-stalks are 1-2 cm. Leaf blade is broadly ovate to triangular-ovate, 4-6 x 3-4.5 cm, hairless on both surfaces or slightly velvety below, base heart-shaped, rarely rounded, margin sharply doubly toothed, tip long-pointed. 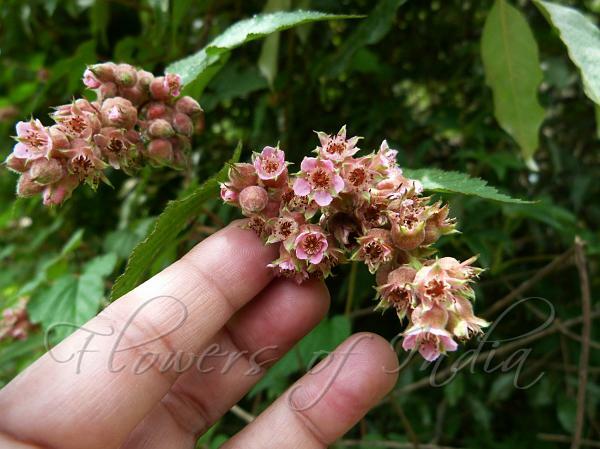 Flower racemes are 2-4 cm, 5-12-flowered, cluster stalks and flower-stalks hairless. Flowers are 5-6 mm across, flower-stalks 2-3 mm. Sepals are triangular-lanceolate, shorter than or nearly equaling hypanthium, densely pubescent, margin entire, apex acuminate. Petals are pinkish or white, obovate, about 3 mm. Stamens 25-30. Seed-pods are ellipsoid, hairless, seeds ovoid. East Himalayan Neillia is found in the Himalayas, from Nepal to Bhutan, Assam, W. China, at altitudes of 2100-3200 m. Flowering: June-July.